Perfectly easy to make oatmeal bars that are kissed with brown sugar are a great grab and go breakfast or fun homemade snack. With just a handful of simple ingredients and a couple minutes of prep you can have these delicious oatmeal bars in the oven and ready to devour! 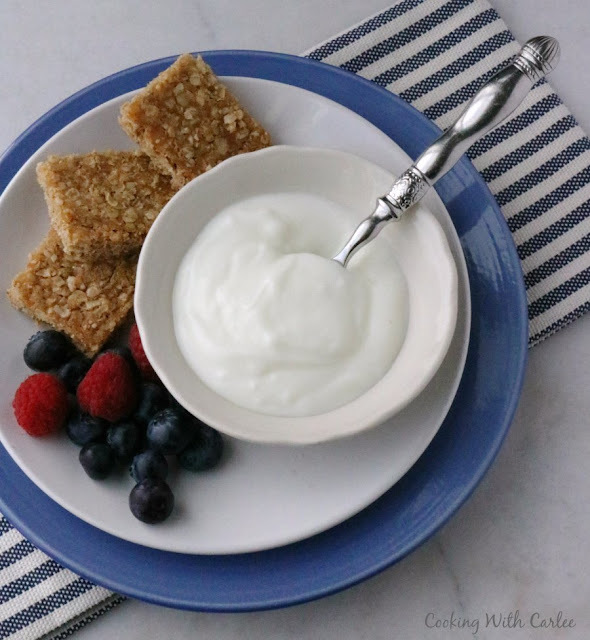 They make a perfect grab and go breakfast for busy mornings. You could also serve them with fresh fruit and yogurt for a leisurely breakfast. Or pack them for an easy answer to the mid afternoon slump or after school treat for the kids! By now we all know there are a few ingredients I can't help but to love. Of course I can't help but to put brown sugar in things when I have the chance. There's the brown sugar peach cobbler and zapple crisp to show as an example of that. I just love the depth and warmth it adds to a recipe. Even deeper than my love of brown sugar is my infatuation with oatmeal. I mean it's healthy, super versatile and I live the texture it adds to food. If you are a regular here, you know baked oatmeal is a staple on our breakfast table. Some baked oatmeal is dense or dry, but we like ours soft and fluffy . Favorites include brownie baked oatmeal, maple pumpkin oatmeal and pineapple right side up baked oatmeal just to name a few. But we don't only eat our oats baked. There is also room in the table for favorites like apple pie steel cut oats and healthy chocolate oatmeal. Oooh, and there are cookies too. We can't forget the cookies! A lot of our favorites include oatmeal. Take monster cookies, peanut butter chocolate chip cookies and great-grandma's oatmeal raisin step-ons for example. But these bars might be the most versatile of all. They could be served at a sit down breakfast or be grabbed on the way out the door for a quick morning bite. They also make a perfect treat to tuck in your purse for a little snack at work or between errands. Have some ready for the kids when they get home from school to help give them the energy to power through homework or practice. You could even serve them as a simple dessert for when you need a little something sweet but don't want to go whole hog. There are just so many great ways to enjoy them! What are your favorite grab and go treats? In a large mixing bowl, stir together all ingredients until well mixed. Divide mixture between two 8" square pans (or a 9x13") and gently pat down. Bake for 10 minutes or until golden and bubbly. Bars will be soft straight from the oven but will crisp up as they cool. Allow to cool for 5 minutes and then turn onto a cutting board. Run a knife along the edges if necessary to release. Then cut into bars while still warm. Cool completely and then store in an airtight container until ready to eat. Yay! I hope you love them! I love this. Totally going to make these this weekend and see if my kids will eat them (otherwise, I get them ALL!). Yum! I should be doing schoolwork but I think I might start baking! Baking is way more fun than school work for sure! So few ingredients...but I bet these taste AMAZING!!! Sometimes the simplest things are the best! Thanks! 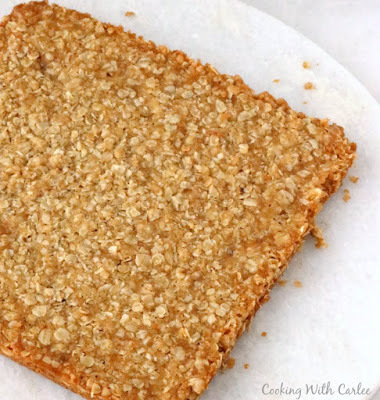 Brown sugar and oatmeal bars - that sounds like a great combination. You may get us eating healthy yet! Bars are such a convenient way to eat. Sometimes when we are in a hurry it is perfect. Nothing like grabbing something to eat on the way out the door. Thank you for another nutritious recipe. I love all of the ways you can make oatmeal fun! These remind me of granola bars. Perfect afternoon pick me up. Mmmmm... Gotta try this! 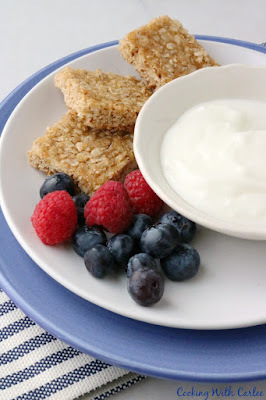 I do love oatmeal and all that you do with it :) I turned one of your oatmeal desserts into a breakfast dish, and we love it! 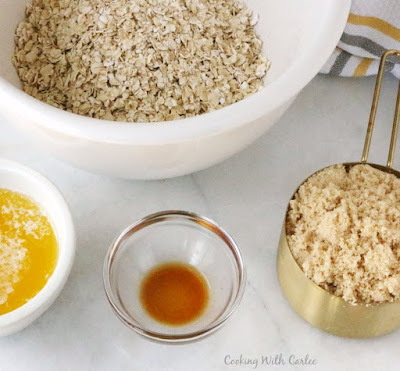 There are never too many oatmeal recipes!